It is a very personal need for me to write about the younger history of my birthplace Damitz. As there already more than 50 years passed since this sad events, I am the opinion that we should put an end to it. We should each one for himself and as a community, put an end to this past and lead our view forward. There happened and has been suffered much injustice, more innocent people suffered than doer. But if we care that such events will never happen in our countries again we will establish a more valuable heritage to our children and grandchildren than the lost properties would ever have been. In principle this is the one side of my message. The other side is the moral matter. Such an endline can not be done only onesided. The Czech State represented by its Administration and President has yet not had the braveness to face themselves and the Czech population with the Czech guilt. According to the still valid Czech law, any acts including murder, torture and other which are considered by the human society as heavy criminal acts, done on German and Hungarian civil people (and not to forget, the murdering of helpless wounded German soldiers in military hospitals!) in 1945/46 are still not considered as a punishable criminal. Even when it is not easy to admit that Czechoslovakia has not only been a victim of German Fascism but that in Czech name and with support of the government injustice and criminal acts happened, the history will not spare the Czech Republic with this truth. The question of resettlement of some Sudet Germans will anyhow work against the Czech Government. The free chose of the individual residential place is EU Law and Right. The moment Czech Republic will join the EU, this right will include also CR, in fact each citizen of the EU will have the right to live in CR, also Sudet-Germans. So why to wait till then ? (Hungary i.e. invited already all former Hungarian-Germans and their descendants to resettle in Hungary.) It would even be an economic advantage! One final Remark: As long as some of the Benesh Decrets and especially the so called “Amnesty Law” (general pardon) dated May 1946 are still the “Basis of our System of Justice” (President Havel in Spiegel-Interview) the Czech Republic can not be considered as a member of the EU. Half way between Brünn / Brno and Znaim / Znojmo., where the railroad crosses the E54, which we named before the “Kaiserstrasse”. Till 1945 Damitz was a village with only German population. This population has been evicted with the exception of one family in 3 shipments to West Germany mostly to Bavaria and North Wuerttemberg / Baden in the first 6 months of 1946. Some Families were deported to “Inner Czechoslovakia” to do “slave work” on farms. This was the right acc. to the Benesh Decrets. In advance to our eviction we were brought for some days to a so called collection camp and also those above mentioned families were brought to that camp. Each person was permitted to take 50kg of luggage with him, but the goods to be taken along was depending on the permission of the new –Czech “Owners” of our houses and all our other goods. Acc. to the Benesh Decrets, everything has to be taken away from Germans therefore the new owners wore sometimes the clothes of our parents and their children our shoes. We were mentioned as stateless and without any things of our own, (as it was mentioned in the opening at the court were our fathers were accused of being German). In that camp our baggage has been searched again and many things have been taken away or been damaged. How the new “Owners” came to the ownership of our properties? In summer 1945 mostly men went through our village, looked at houses, went in sometimes accompanied by men with guns, checked everything and when they liked it, they went to the “Kommissar”, who was the new administrator, and there they got registered and got a certificate -a kind of title-deed- showing them as the owner of the house Number …. . In some way fortunately my fathers house has been partially damaged by bombs, so it was relatively unattractive in the first row, later a 22 years old single man from Wolhinia moved in so we were in a relatively lucky position. In some cases the German families had to leave their houses immediately and had to find a quarter in the houses of relatives, some were deported (see above). For some time some gangs were terrorising the village, searching for hidden goods robbing and torturing and even killing one German man, we had the impression that even the new Czech settlers were afraid of them. 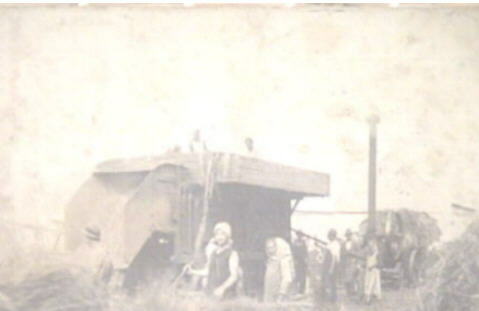 After the first so called “gold diggers” the village was populated step by step by also not on their own will coming Czech people from Wolhinia (now Ukraine). They were also forced to leave their origin home country. Their advantage was only that they could move into intact houses. This was not our case. Damitz has been first mentioned in the 14th century. Such first signs were without exception when some properties ownership moved from one monastery to another or from one feudal master to another. People were properties so they have not to be mentioned. In the 30years public war (1618 – 1648) the population has been decimated nearly total and has been repopulated by the owner which was at that time the Monastery Bruck next to Znaim / Znojmo. People, bondmen or tenants with names which were still known there till 1946, as Hawle, Huber and so on, who were obliged to work duty (robot) to their feudal masters. I think that the people in the past time had enough problems to feed themselves and their children, they had not much time to think about their “Nationality” if they knew what that is! They have to be what their priors dedicated them, Catholic or Protestant, German or Czech. As already mentioned above, during the 30 years civil war, the population has been decimated to nearly cero. The village was repopulated by the monastery of Bruck. According to the results of the investigation of Dr L. Wieder mostly with people from the valley of the Thaya/Dyje River,from the district at the border Moravia/Lower Austria. He came to that conclusion by comparing names because written documents are poor. I think it is a legal way for such an investigation. But when I continue that way, I came also to names which are undoubtly of czech origin, as there are Zibuschka, Tatschek (from czech Ptacek = little bird? ), Nesnidal, Hanak, Janda names still existing in Damitz till 1946. That leads to the result that also czech families moved in, of course only with permission of the feudal owner, which was the m onastery of Bruck. It can be taken for sure that this people adjusted themselfes in language and even by modifying their names slightly to the german speaking majority and became member of the german speaking population. I prefer the expression "german speaking " and "czech speaking" it matches the reality better. After being released to freedom about 150 years ago, they remained what they had to be, German or Czech (-speaking). Because and that is my conviction the affiliation to one of the languages was depending on many factors out of the decision of an individual and was therefore not only or may be even just little depending on a national conviction. I am speaking about villages, not towns. As most of the towns were founded in 12/13th century by German settlers, which were invited to come into the country as miners, craftsmen etc., the German element was dominating in most of the cities till beginning of this century and has had its serious influence in culture and economy till 1945. As Damitz or today Damnice is located in Moravia, one should also know that the national contraries which came up during the 19 century and found their expression in the ideas of Palicky and Havlicek-Borovsky on one side and Löhner and his circle on the other side was mostly concentrated to Bohemia, Moravia refused even to be involved in that conflict. Damitz but is located in Moravia, that is why the expression "..speaking" is permitted. 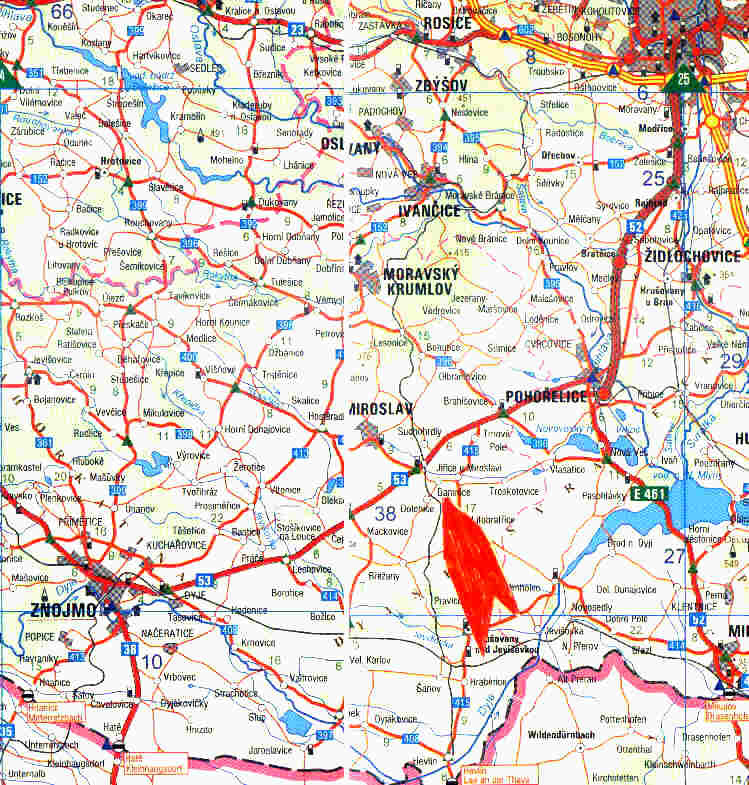 For those who don`t know it: Havlicek-Borovsky was the first who spoke about the removing the germans from Bohemia but also Lühner was on the other side who had first the idea of connecting the german populated counties of Bohemia to Germany! Both ideas had no historical legitimation. Both ideas came into Reality 100 years later under most horrible circumstances! Havlicek and Löhner came later , independent from each other to the conclution that the national problem should be solved by forming national counties connected together in a Federation. Much later in 1905 such a model was realized in the so called "Mährischer Ausgleich" translated "Moravian Balance" within the "Austrian - Hungarian Monarchy". One should also not oversee that the Jewish population of Bohemia and Moravia could also be added to the German speaking population for example Franz Kafka, born and brought up in Prague visited German school and wrote all his works in German language. One of my older acquaintance mentioned once that “this Hitler made us all poor” I want to add also Benesch, I think not only those who had to leave the country which was for Centuries the homeland of their forefathers but also the Czech People.